The physical properties of graphite make it an ideal choice for this purpose. Steel requires extreme temperatures in order to melt into liquid form to be used in other metal fabrication processes, and graphite is able to conduct electricity at even extremely high temperatures. The electric arc furnaces themselves are large containers. The steel scraps for recycling are placed into the container and the roof is lowered. The graphite rods, or electrodes are components of the roof structure of the furnaces and are assembled into columns and attached to the roof. Depending on the manufacturer, the electrodes can be as small as 3 inches in diameter, or as large as 30 inches. This will also be dependent on the size of the furnace and the volume of material requiring melting. The electrodes will reach up to 5000°F, half the temperature of the surface of the sun and therefore machined graphite must be used as it is the only material that can withstand such high temperatures and maintain its shape and structure, as well as continue to conduct electricity. The electrodes are attached to an electrical source and in turn generate that energy into heat. Graphite electrodes are typically coated with siloxane fluid which is able to reduce oxidation at extreme temperatures. 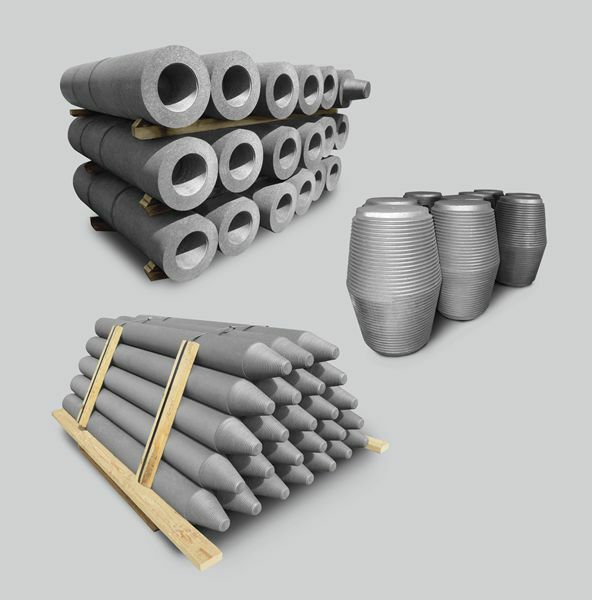 The different specifics of graphite electrodes are chosen based on various application considerations such as furnace design, power level, fume control system, scrap requirements and charging practice. These factors will help to determine the particle size, shape and length of the graphite electrodes. Electrodes are typically formed using an extrusion process in order to maintain material integrity and form the desired length and shape. After the steel has melted as a result of the extreme temperatures, it is drained into vats and moved quickly to metal fabrication processes to be made into new metal products. Further uses for graphite electrodes include refining steel in ladle furnaces, smelting processes and for removing defects in castings and weldings. Graphite Electrodes Steel is commonly recycled as it is able to be melted down and reused a number of times requiring the use of electric arc furnaces, which work best when run with graphite electrodes.